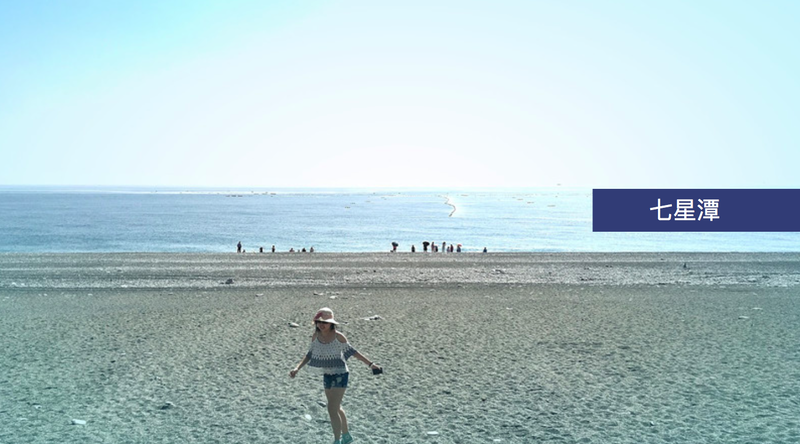 Taiwan - the land of never-ending night revelry, delectable street food and gorgeous scenery. 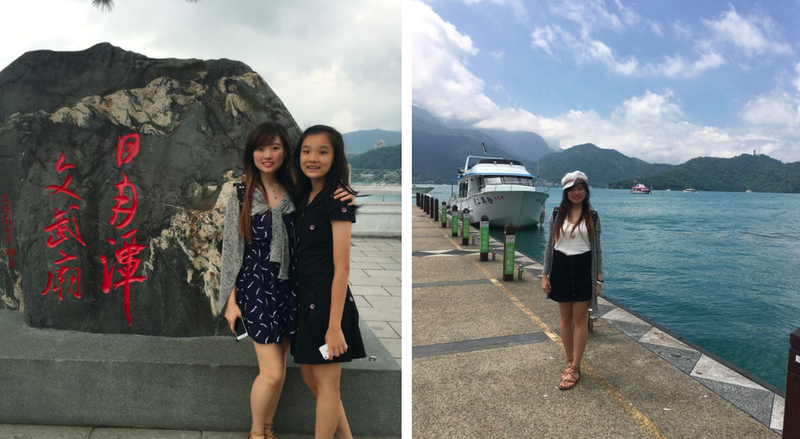 In June, her weather was almost comparable to Singapore's, with sweltering heat and stifling humidity. 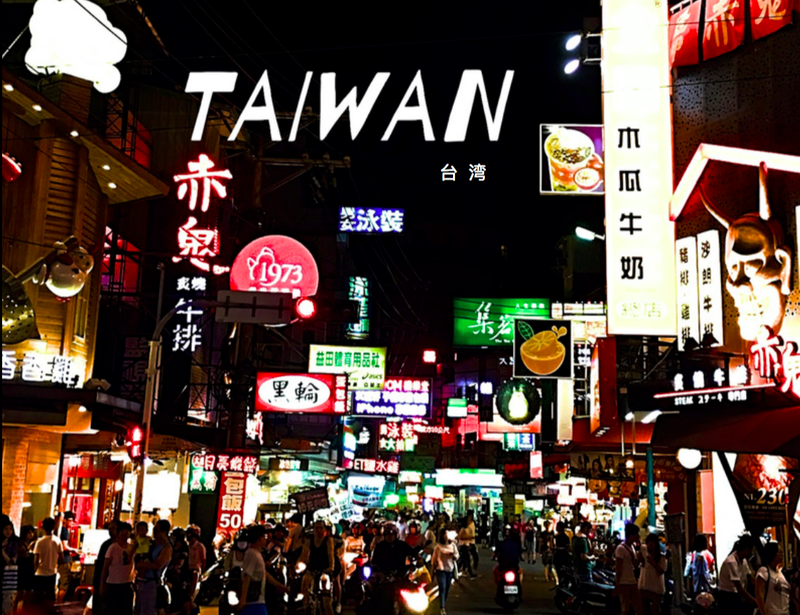 Probably most well-known for her night markets, a trip to Taiwan will not be complete without a visit to the famed foodie havens. 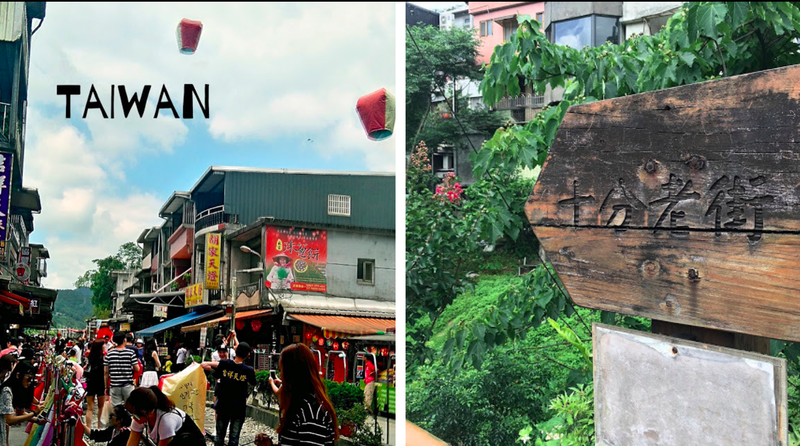 Impossible to conquer 5 night markets, 12 sights in 8 days in Taiwan? Read on! 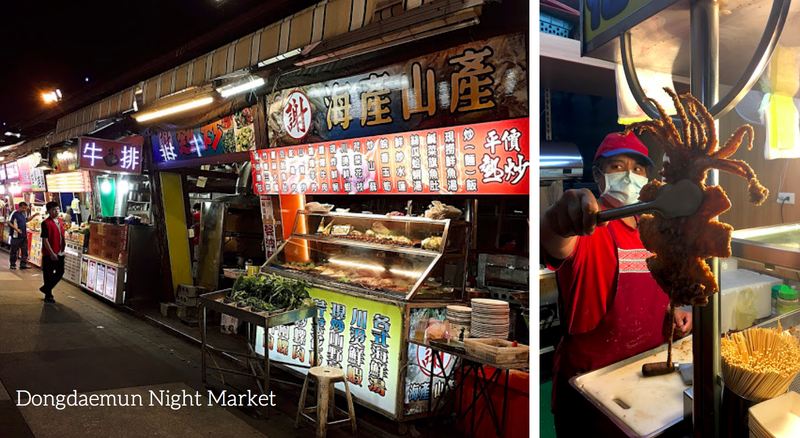 Shilin Night Market is THE place you always see on travel variety shows and it's definitely full of amazing street food. Hot Star Crispy Chicken (70 NTD) is a must-try. Now this is when we relegate the calorie-counting to the back of our minds. The queue for 大肠包小肠 (pork sausage wrapped in glutinous rice) was rather impressive, so being typical kiasu Singaporeans who believe that long queues = good stuff, we joined the queue. It was decent, but not really impressionable enough to warrant a second try. The Mee Sua (30NTD) stall nearby sells a pretty mean bowl of budget mee sua. Cheesy potato with ham was one of the recommended foods by other travellers. For 50NTD, you get a deep fried potato drenched in a generous serving of nachos cheese, topped with ham, pineapples and corn. The first few bites were decent but after a while, the sweetness of the cheese and mushiness of the potato put me off. Fried ice cream was was definitely a novel treat - I loved the strawberry-flavoured deep-frozen ice cream wrapped in deep fried pastry puff. Besides the open air night market, Shilin has an underground basement food street. The stinky tofu (45 NTD) was mild, as compared to what I've had in China. While it looked pretty in photos, what with the golden brown crisp, fillings and colourful toppings, it didn't pack much of a punch. 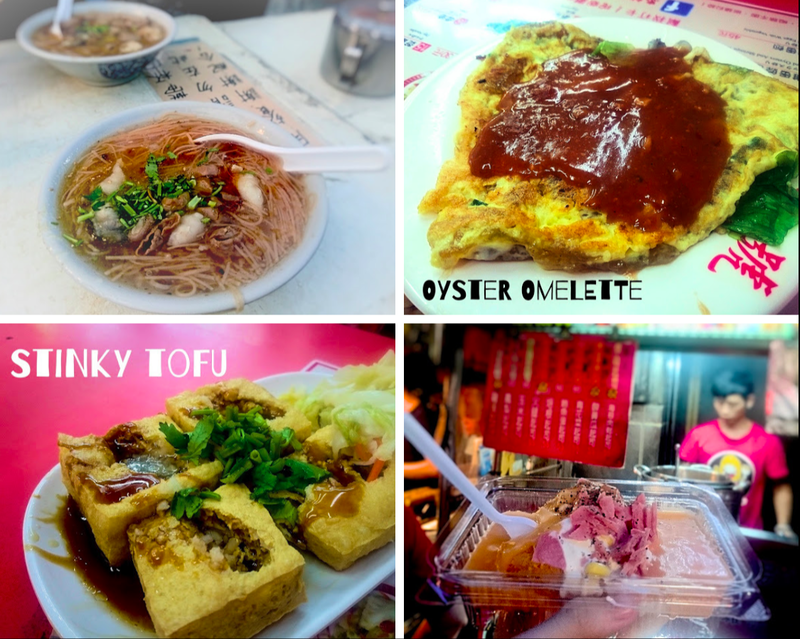 Taiwan's version of the oyster omelette (60NTD) was totally different from Singapore's Orh Luah. The omelette is more "egg-y" and it was drizzled with a sweet sauce. Though an interesting take on the oyster omelette, I would very much prefer the Singaporean version. It is a mega-night market formed by linking 3 night markets together. 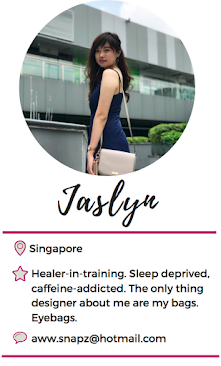 I loved how the place was so spacious and non-crowded, unlike that of the other night markets, where you'll be jostling against waves of bodies. One must-try would be the deep friend squid. 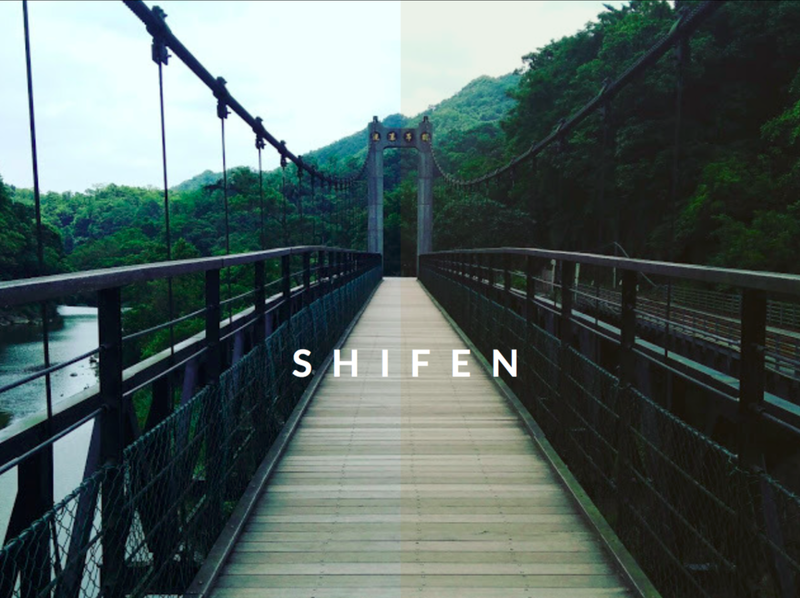 With an old railroad track running through this quaint town, Shifen Old Street exuded rustic vibes and looked like someplace straight out of a movie set in the 60s. 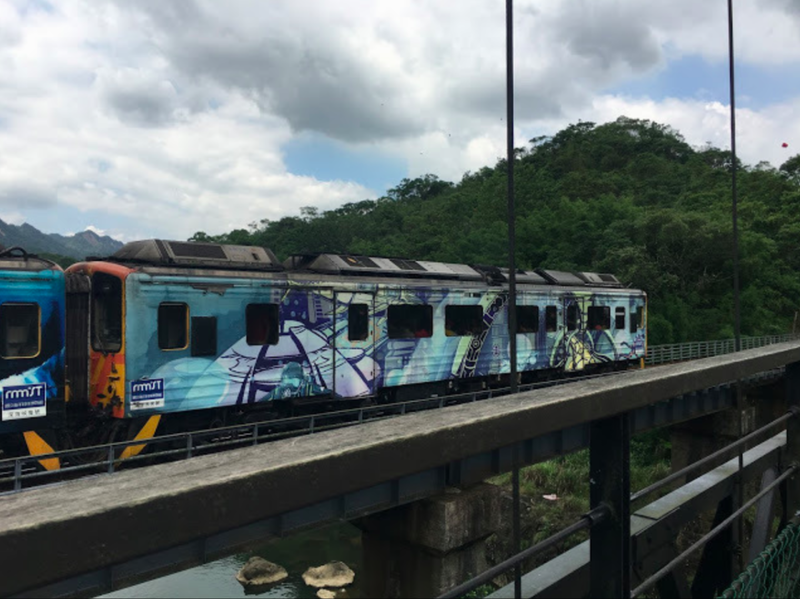 The railway track is still in use, so once in a while, you'll see trains chugging along, with tourists dashing off the tracks to make way. It's a perfect spot to take #ootds, I would say. 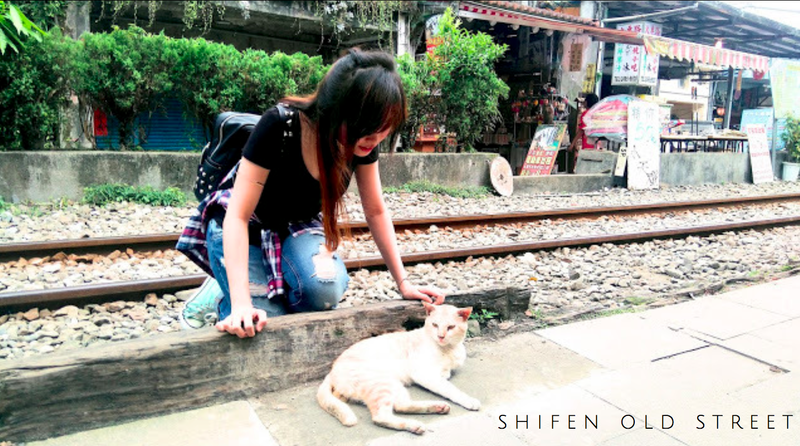 I spotted quite a few cats milling around the area, and one particularly bold one promptly sat itself next to where we were taking photos, and started preening itself. 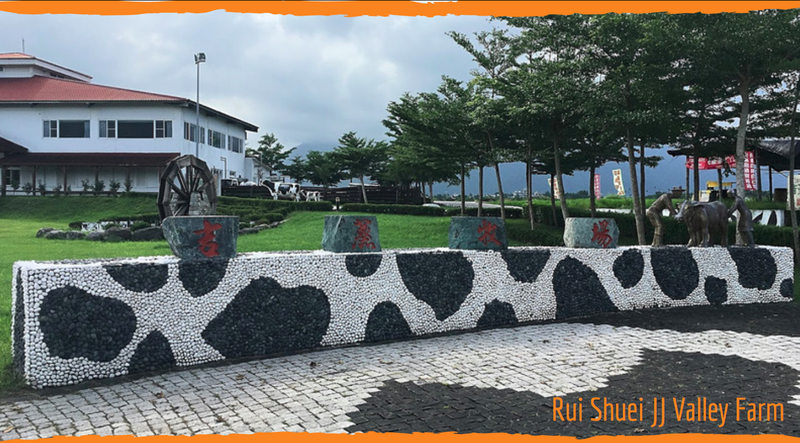 Shifen is famous for their Sky Lanterns, where visitors could write their wishes on these lanterns and send them off into the sky. Health, happiness, luck, love and maybe fortune. They had mini sky lanterns as souvenirs, which I bought. After my purchase did I realise that such trinkets were sold at a cheaper price in a restaurant just a little way down the road, near the entrance to Shifen Waterfall. 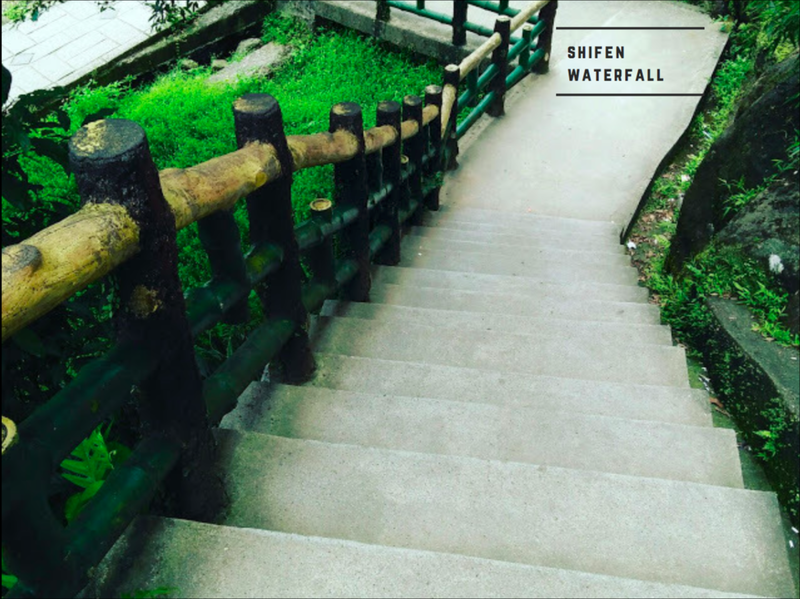 We were supposed to follow the winding path staircase and bridges to reach Shifen waterfall but it was a terribly long walk under the blazing sun, so we gave up once we reached the bridge. The riverbed was rather dry at the time when we visited, so we figured it wouldn't be as magnificent. 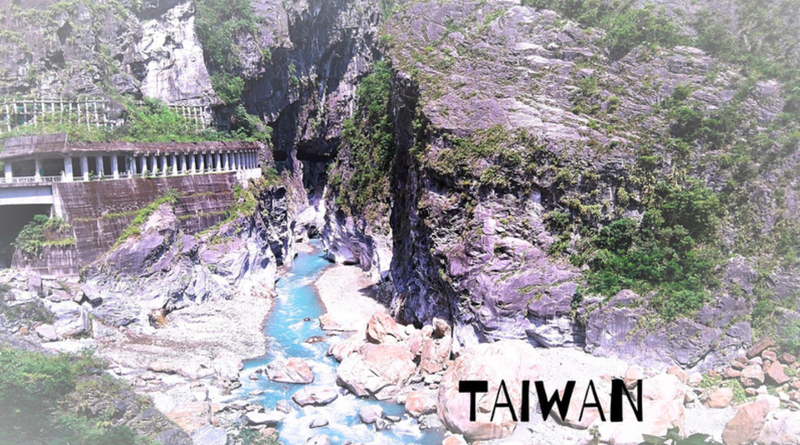 If you visit Taiwan at a better season, perhaps it would be worth it to view the waterfall. 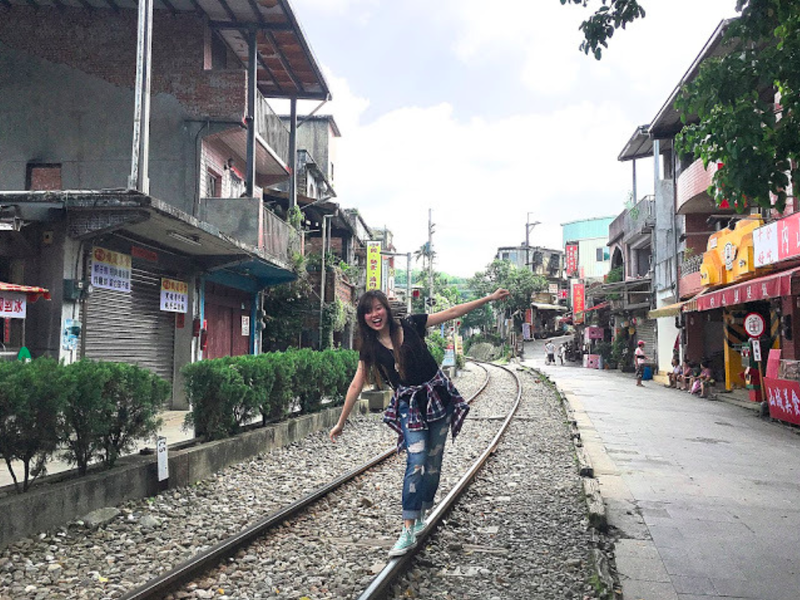 Jiu Fen, a mountain town accessible only by narrow winding steep roads, was made famous by the films, "A City of Sadness - 悲情城市", and Spirited Away. The old street has quite a few famous street food stalls. We ordered beef noodles at 100 NTD and dumplings in beef soup for 50 NTD from the shop near the street's entrance. The noodles were incredibly Q and the beef was juicy and tender. I would have ordered more if not for the fact that I was once again, saving tummy-space for more food. Their yam balls in shaved ice (50NTD per bowl) was amazing! We went on to have a taste of Taiwan's famous 卤肉饭 (braised meat rice at 30NTD)， 醉鸡 (drunken chicken at 160NTD) & 综合鱼丸汤 (mixed fishballs soup at 45NTD) at the 九份传统鱼丸 (Jiu Fen Traditional Fishballs) stall. 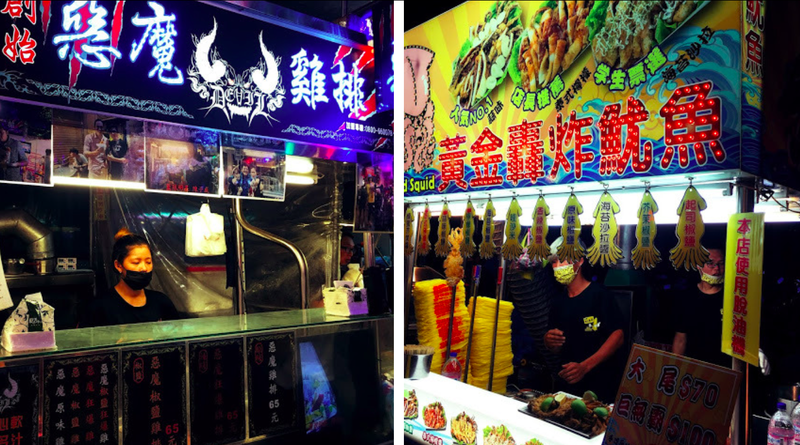 At our time of visit, this stall was ranked as the top 3 stalls for its braised meat rice in Taiwan. True enough, it was delicious, with its rich gravy and tender pork with just the slightest bit of fatty layers melting in your mouth. The traditional fishball, fuzhou fishball and meatball soup fell short of expectations though. 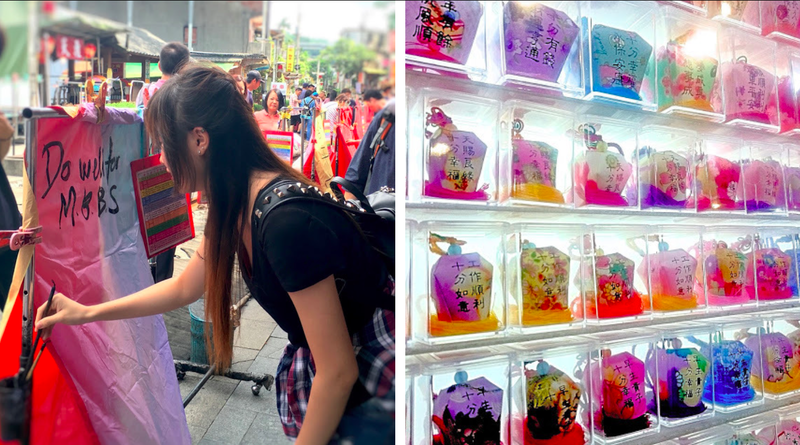 While strolling along the streets, we came across an ocarina shop and I was so intrigued by the instrument that I bought a mini ocarina at 150NTD. It was a curious little trinket for sure. 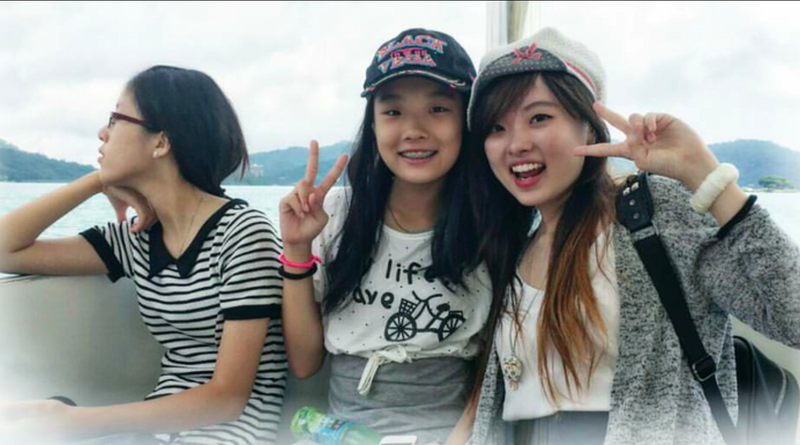 Pebble Beach (七星潭) is a splendid beauty, with vast expansive views of the sea, sky and mountains. True to its name, the beach is filled with pebbles instead of sand. It would definitely be a novel experience to build pebble towers in place of sandcastles here. 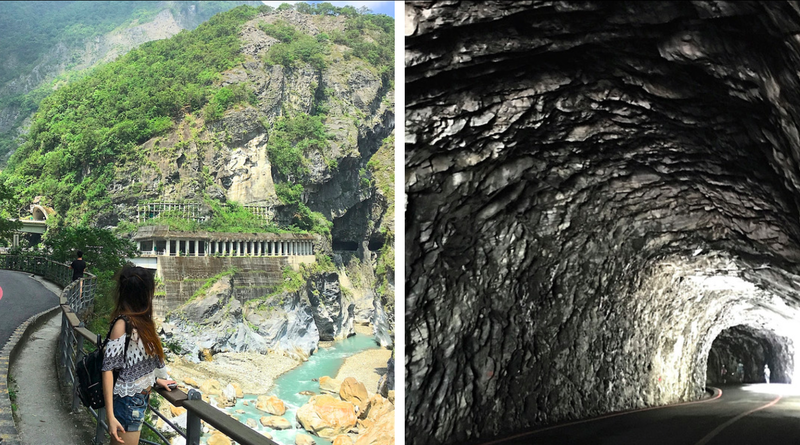 Hualien is one of the biggest marble producers in the world, and Taroko Gorge is literally filled with deep marble canyons. 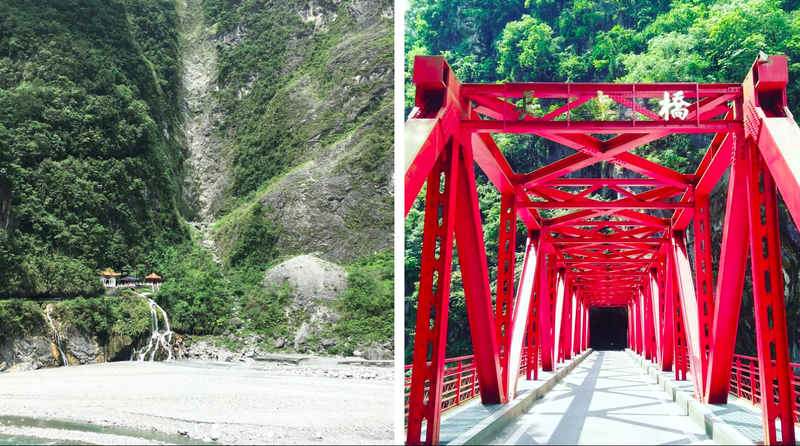 The suspension bridges, marbled canyon walls and cyan waters looked like it came straight out of a Nat Geo postcard. We entered the Swallow's Grotto to get to viewing platforms with better vantage points but we had to wear helmets during the trail as mini pebbles might fall from the mountain tops. It was said that a small pebble falling from the top would have the same acceleration and force as a bullet. As you drive along the road, you'll see the Eternal Spring Shrine. 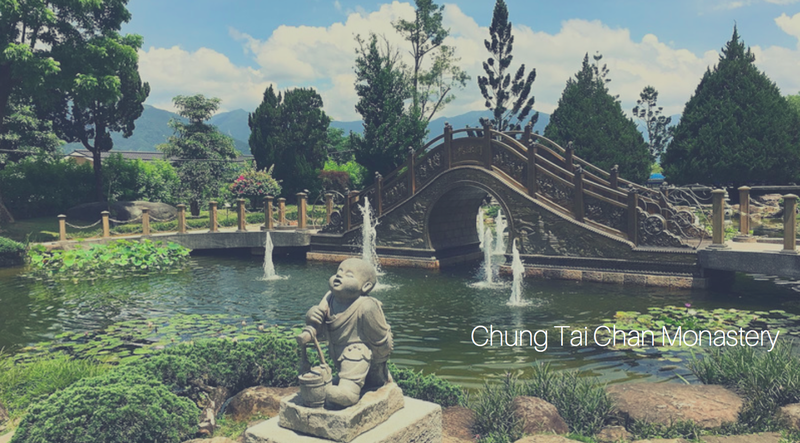 長春祠 (Eternal Spring Shrine) was built in the Tang Dynasty's architectural style. 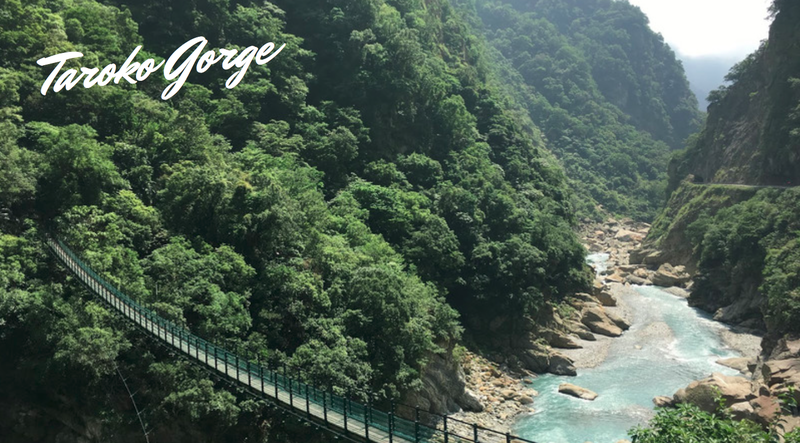 Perched right above the spot where natural spring water flows down to the Liwu River, everything about it is picture-perfect. Kids will love the up-close interaction with the animals. 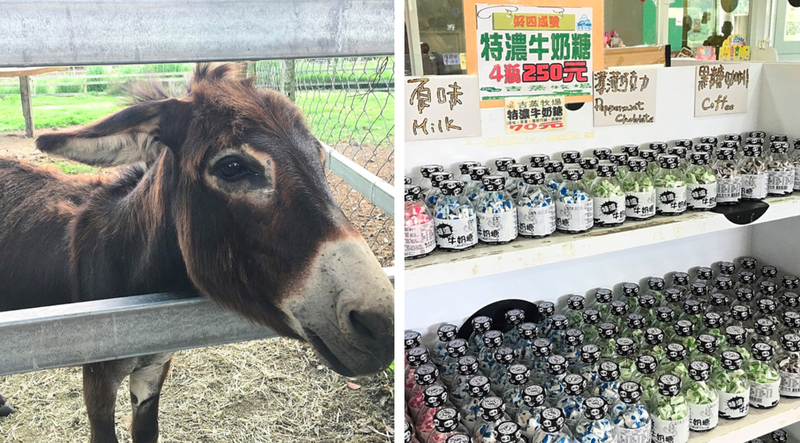 You can feed donkeys, goats, and ponies. At the farm, they have cows, chickens, peacocks, and even an emu! Their souvenir shop sells some pretty nice milk candy made from freshly-produced milk in various flavours. 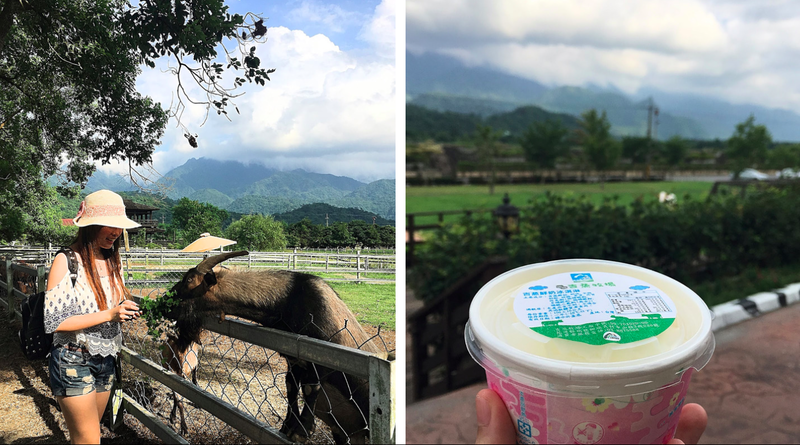 If you're a major fan of Hokkaido fresh milk, you'll probably appreciate their fresh milk ice cream too. 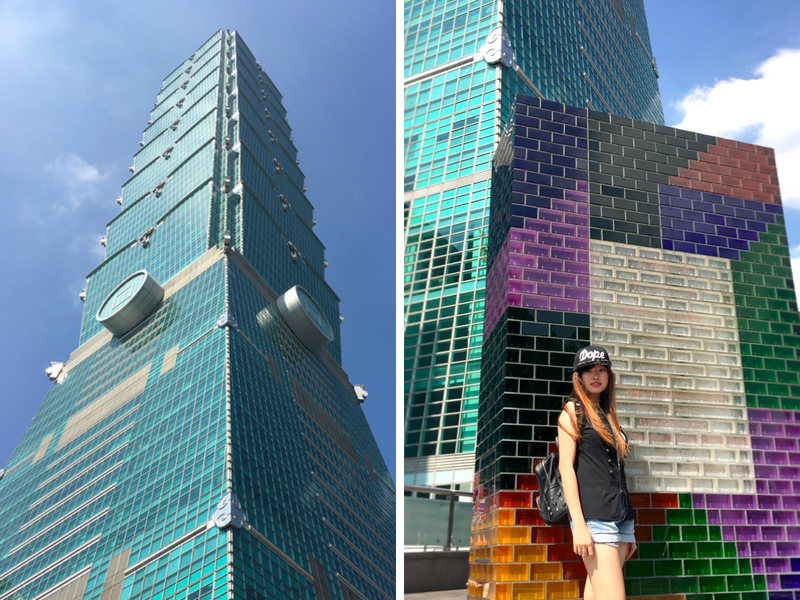 This majestic structure towering above Taipei used to be the world's tallest building. 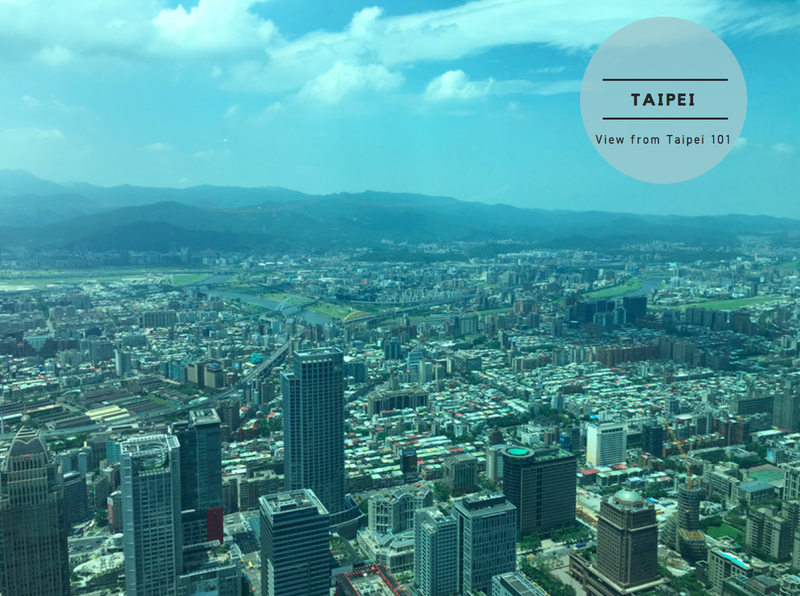 For a bird's eye view of the entire city from Taipei 101, you can choose to dine at Shinyeh Restaurant on the 85th floor. I would have to admit that the chefs certainly did impress with their culinary prowess. 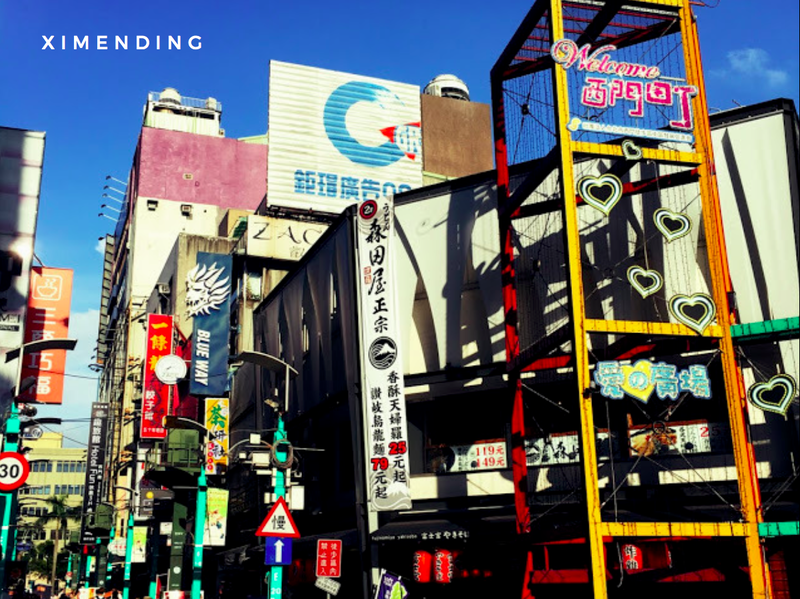 Ximending, the Dongdaemun of Taiwan, is a pedestrian shopping haven with a plethora of fashion shops, food stalls, restaurants and bars. 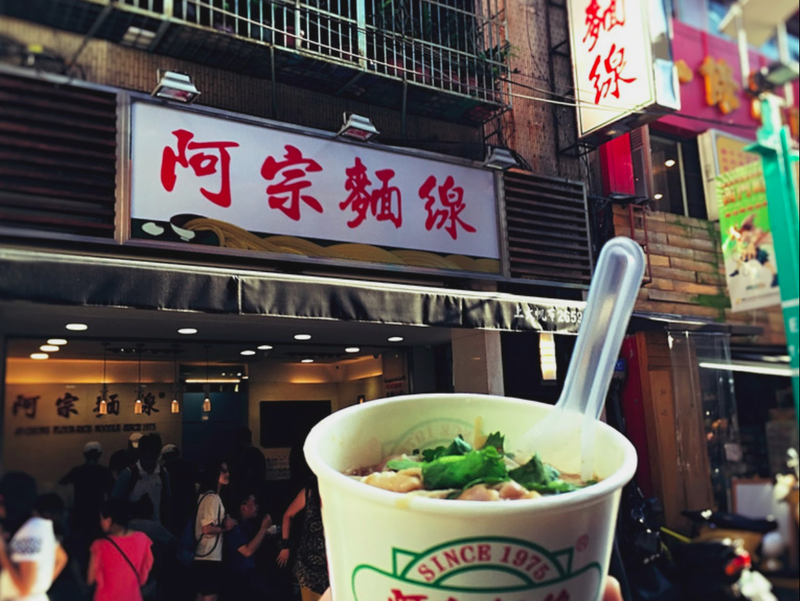 Home to the highly raved about Ah Zong Mee Sua, most visitors would never leave Ximending without trying the authentic Ah Zong Mee Sua right at its place of origin. It was rich, thick, and full of ingredients. The thin mee sua was so smooth, the bowl of piping hot goodness so fragrant, and the pork intestines so chewy i would gladly brave the hot sun to queue for another bowl of this amazing creation. Another notable recommendation at Ximending would be their Mango shaved ice. While the clothes and shoes there are unbelievably gorgeous, shopping at Ximending wasn't as cheap as I would have expected it to be. If you happen to be tall and non-petite like me, the dresses on sale there would end up being too short for you. However, if you are a user of cosmetic or contact lens, these are sold in Taiwan at only around SGD 10 per pair. 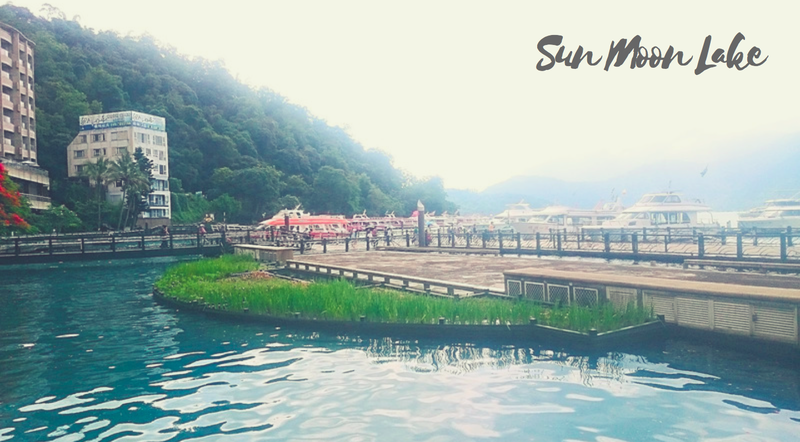 Named one of the eight wonders of Taiwan, Sun Moon Lake rightly deserves the title. The shimmering turquoise waters are simply splendid. Taking a cruise around the lake took around 20 minutes, and you'll be able to see the mini island in the centre of the lake that divided the lake into the shape of a sun and a moon (hence the name). The island was named Lalu Island in honour of the Thao tribe. There used to be a pavilion on the island, where marriages were held but the 921 earthquake diminished the size of the island such that no one ever steps foot on it these days. 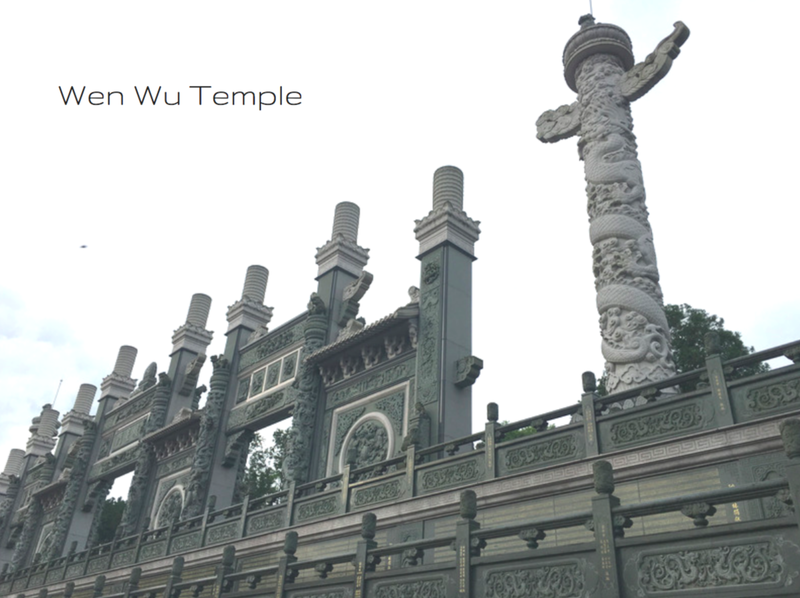 The Wen Wu Temple is a grand temple located right beside the lake. It was said that in the 1999 921 quake, more than half of the temple was destroyed but the people in the living quarters were spared when a crack went on a sharp 90 degree to avoid that particular building. It has gorgeous architecture and intricate craftsmanship, with fully hand-carved figurines of deities afixed to the ceilings. 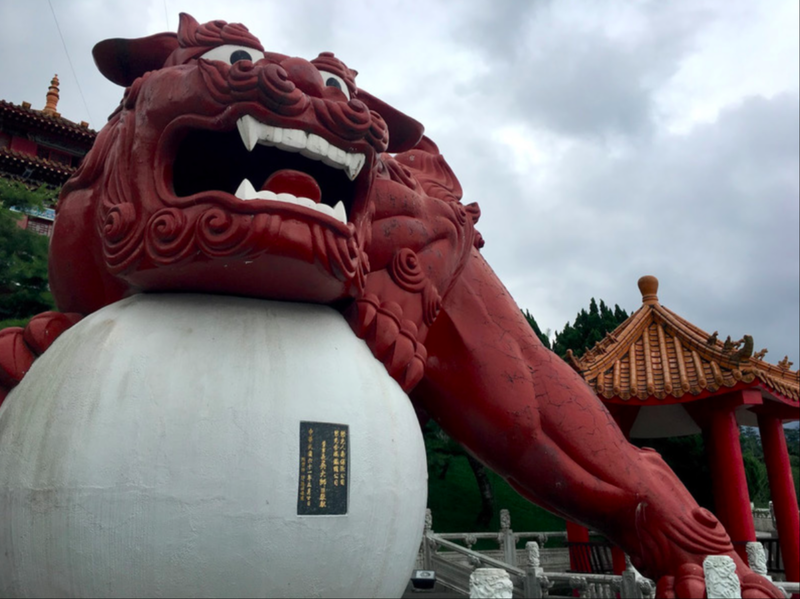 We dropped by Chung Tai Chan Monastery for a quick look at the cool architecture and giant sculptures of guardians and deities. 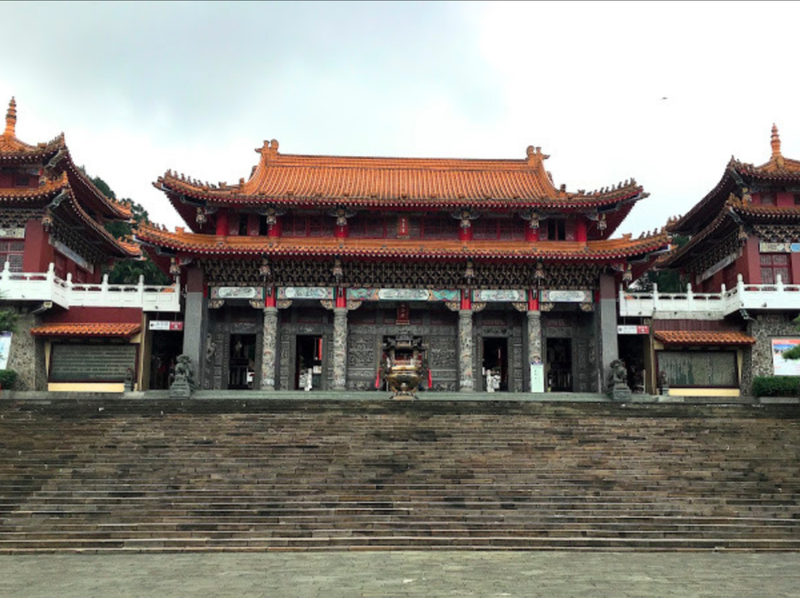 The monastery was designed by the chief architect for Taipei 101 and it is definitely a majestic building. 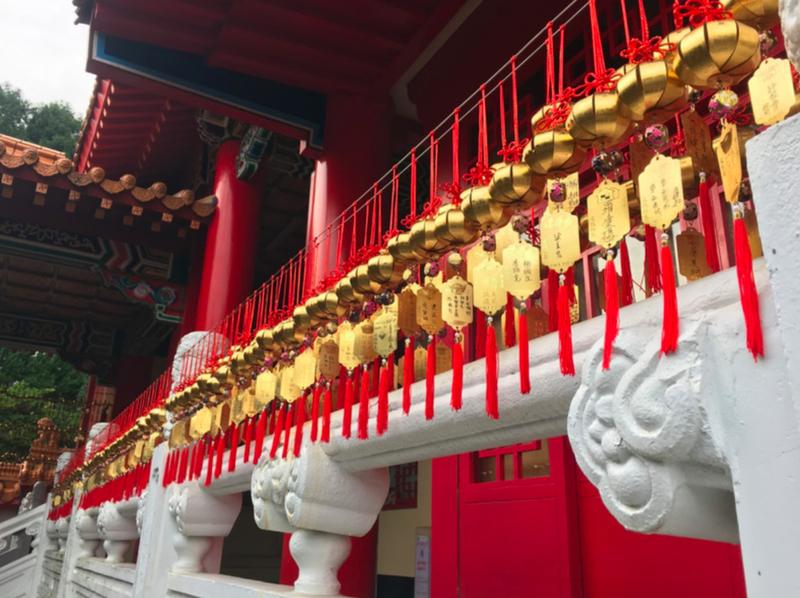 It is a 43-storey temple with a 7-storey indoor pagoda built without using a single metal screw or nail. Their outdoor garden was also rather picturesque. Out of respect, I didn't take any photos within the monastery buildings. 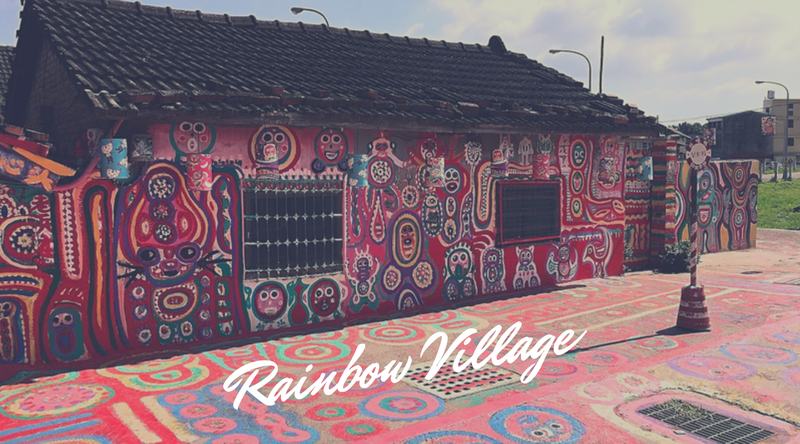 Located in Taichung, Rainbow Village is a vibrantly coloured attraction, with all paintings hand drawn by Mr Huang, a veteran of the KMT. 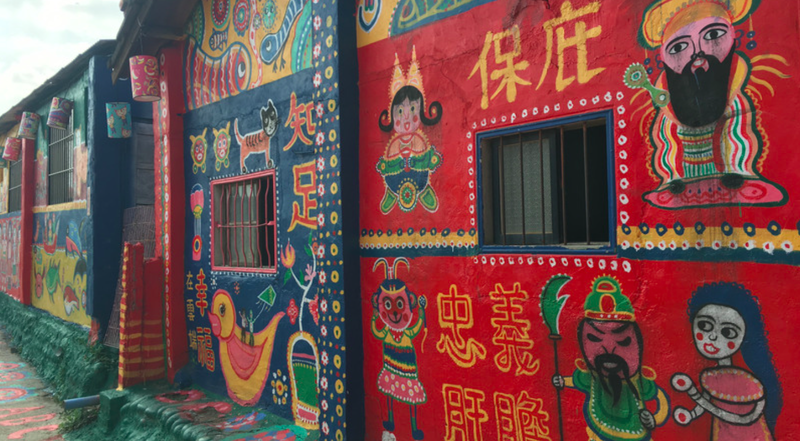 The Taiwan government originally wanted to demolish the village but petitions from the public made them preserve it as a tourist attraction. Now that's a good place to take step #ootds. 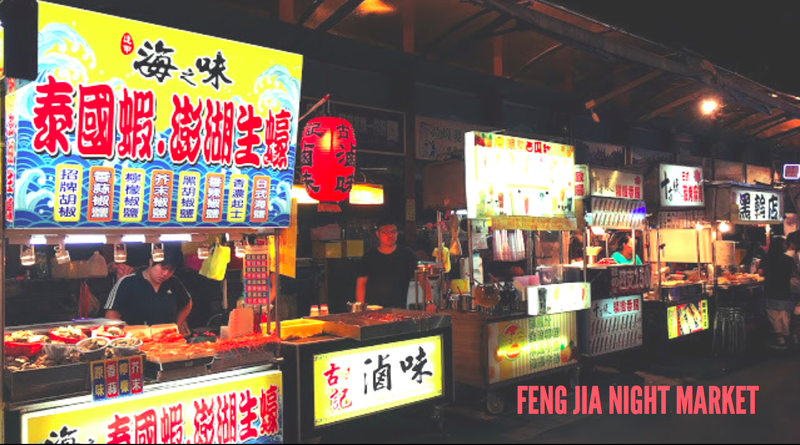 Fengjia Night Market is so HUGE you can never finish walking through all the alleys within 3 hours. It was bustling with people and the fragrances coming from the various food stalls lured out my inner glutton. 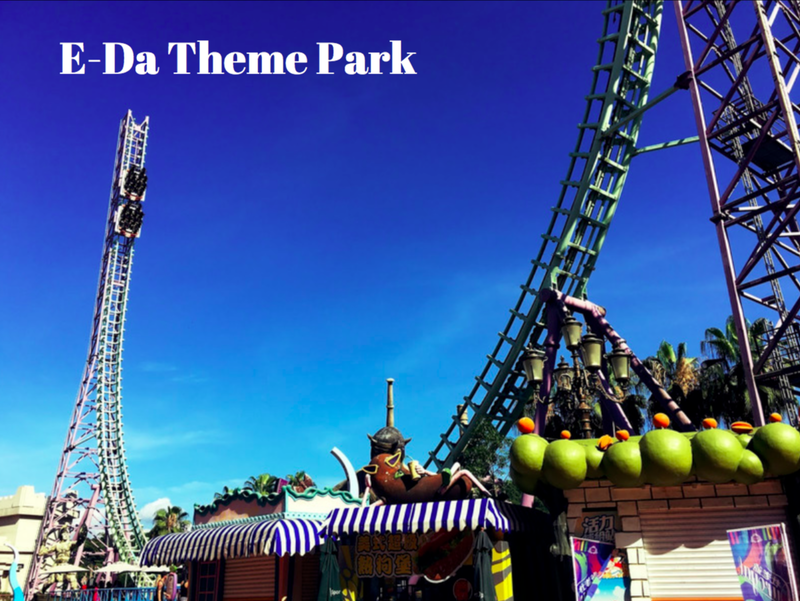 E-Da Theme Park is one of Kaohsiung's main attractions. 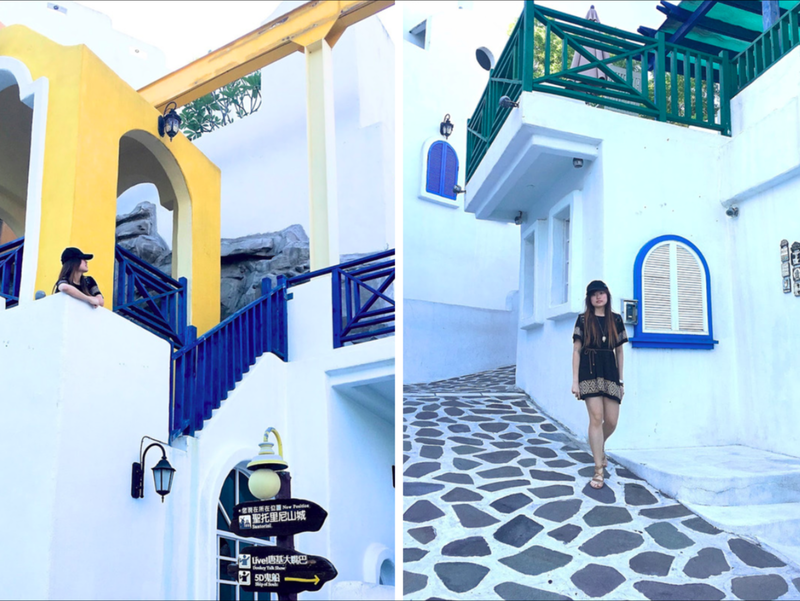 It's the only Greek Aegean Sea styled theme park in Taiwan. 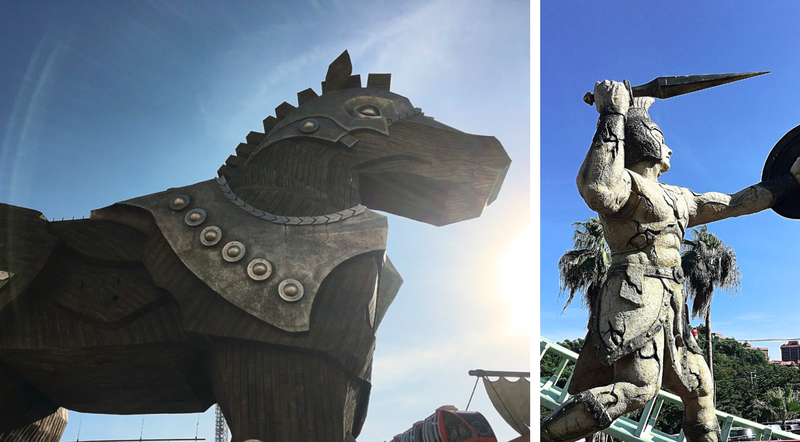 The park's divided into three major regions: Acropolis, Mountain City and Trojan Castle, with rides that range from indoor kid-friendly to outdoor adrenaline-rush-inducing ones. There was even a mini Santorini perfect for photo shoots. 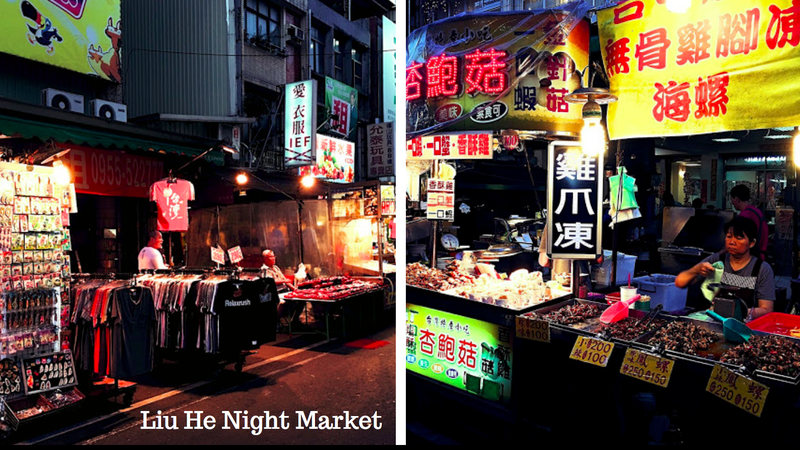 Almost every city in Taiwan has their signature night market and in Kaohsiung, it would be Liu He Night Market. 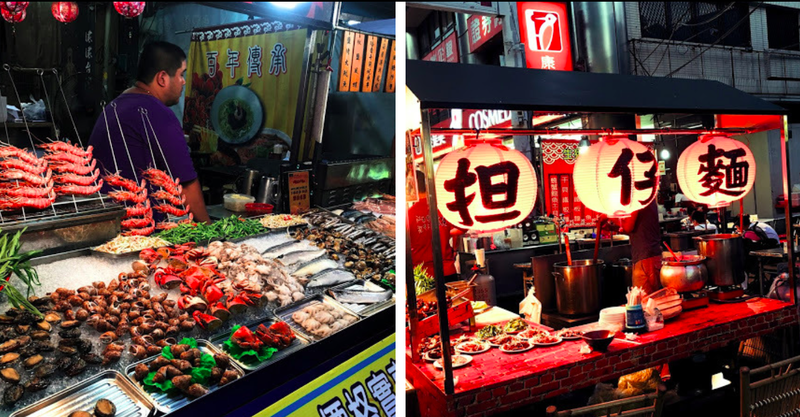 Though there were rows upon rows of street side food stalls, i didn't find the prices here as budget-friendly as the night markets in Shilin or Fengjia. However, you should try their fresh seafood for those are live catches from the sea. 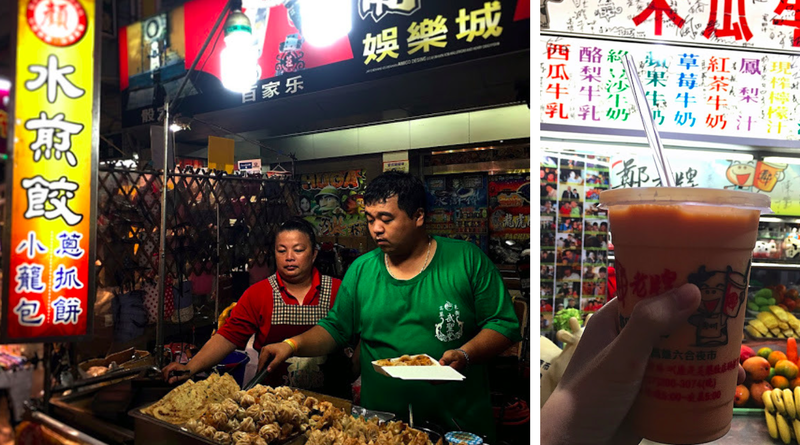 One of the must-try at Liu He would be the papaya milkshake from the stall frequented by even celebrities and politicians. Just walk till the end of the street and queue up behind the longest queue present there and you won't go wrong. Also, if you still have extra stomach space, you should get the pan-fried xiaolongbaos from the couple-run stall in the pics above, for they have amazingly crisp skins and tender pork fillings.